Crush croutons from salad mix; set aside. In large bowl, combine remaining Caesar salad mix ingredients and chicken; mix well. Wrap tortillas in moist microwavable paper towels. Microwave on High 15 to 20 seconds or until warm. Spoon salad mixture evenly onto center of warm tortillas; spread to within 1 inch of edges. Sprinkle each with shredded cheese and crushed croutons. Fold bottom of each tortilla up over filling; fold sides over. You can use any type of flour tortillas--plain, whole wheat or flavored--in place of the garden vegetable tortillas. 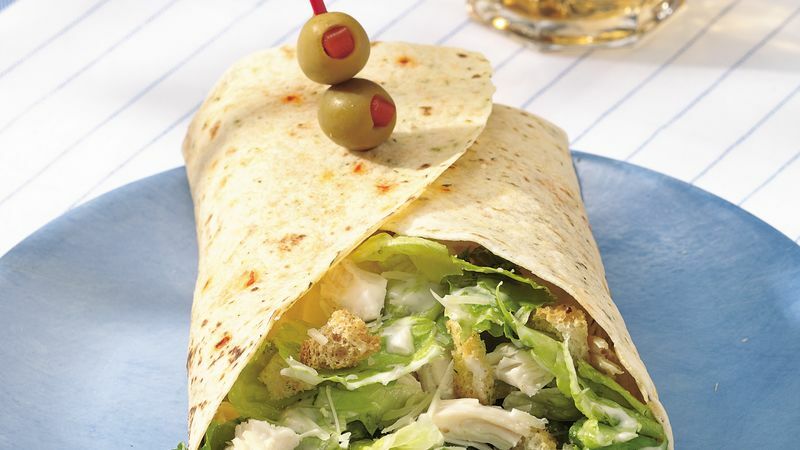 Secure the wraps with picks and olives. Use chopped cooked chicken from the freezer section or leftover chicken from your refrigerator to speed this recipe along. Or try chopped cooked breaded or grilled chicken.